Home / Entertainment / News / Technology / Video / Take a closer look on China's FIRST EVER Interactive Robot 'Girlfriend'! Take a closer look on China's FIRST EVER Interactive Robot 'Girlfriend'! The robot was build in China for over three years to make it incredibly life-like! 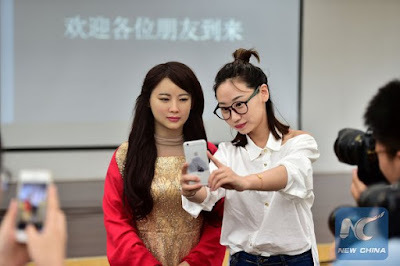 Just recently, China proudly presented their first ever interactive robot that can chat with humans and ever take orders from iCloud. She can offer services based on the cloud technology. According to her developers, she is programmed to match human's facial expression, mouth and body movements. She also knows how to position herself independently. Seen in the video, the interactive robot 'girlfriend' was amazingly made that it can hold conversations with human and even reacts to the camera, held by one of the media's member, which is pushed near to her face saying, "The photo taken from that angle with make my face look bigger." The interactive robot 'girlfriend' also replied to the researcher's hello and said, "Yes my lord, what can I do for you"
Wearing red and gold, the robot is undeniably created beautifully. Her facial features are really detailed. Aside from the almost realistically made face, hair and body construction, the robot amazingly follows order just like when she is asked to wave her hand. Learn more about the interactive robot girlfriend on the video below and share us your thoughts on the comment section!